Today is a chance for beltbags. Turning back to ancient uses and considering the viking age structures, with celtic knots and Othal Rune, meaning the tribe and family kinship. 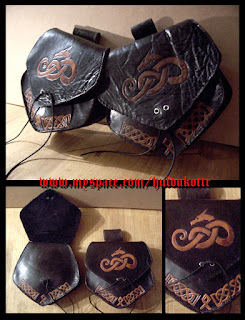 The central ornament is a typical nordic dragon, knot shaped, something common in elder germanic art manifestations. The bags are absolutely hand tooled, and taking apart from the common ways, it's sewed with heavy sewing thread, instead the classic leather ropes.